So where did the voting come in? What was that all about? Voting was adopted, after extended debate, as the most efficient way of ascertaining whether a scholarly consensus existed on a given point. So why pick on the Jesus Seminar? 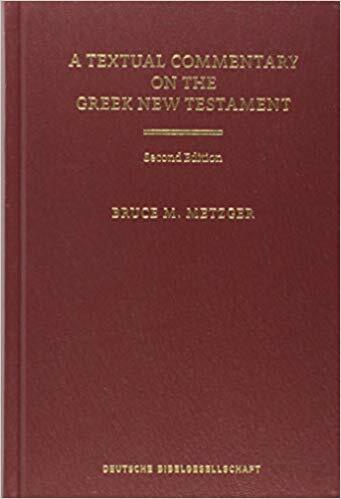 Committees creating a critical text of the Greek New Testament under the auspices of the United Bible Societies vote on whether to print this or that text and what variants to consign to notes. So the practice was not some Jesus Seminar idiosyncrasy? Translation committees, such as those that created the King James Version and the Revised Standard Version, vote in the course of their deliberations on which translation proposal to accept and which to reject. But truth is not really decided by a vote, is it? Voting does not, of course, determine the truth; voting only indicates what the best judgment is of a significant number of scholars sitting around the table. It was deemed entirely consonant with the mission of the Jesus Seminar to decide whether, after careful review of the evidence, a particular saying or parable did or did not fairly represent the voice of the historical Jesus. Tim Widowfield earlier pointed out that ridiculing the practice of voting has been limited to targeting the Jesus Seminar, the scoffers overlooking the practice in other mainstays of their profession. To quote from Bruce Metzger’s A Textual Commentary on the Greek New Testament. . . . . Frequently it had happened that the members of the Committee differed in their evaluation of the textual evidence, and thus many readings were adopted on the basis of a majority vote. In special cases, when a member holding a minority opinion had strong feelings that the majority had seriously gone astray, opportunity was given for him to express his own point of view. Such occasional comments, identified by the writer’s initials and enclosed within square brackets, are appended to the main discussion of the textual problem in question. . . .
Κύριε, which is absent from א* 33 565 vg syrs copsams, bomss, may be regarded as an accretion in the other witnesses by assimilation to ver. 36. On the other hand, however, in view of early and widespread manuscript support for the word, a majority of the Committee voted to retain it, explaining its omission as either accidental (κύριε was often contracted to κε) or deliberate (because it seemed redundant so soon after Κύριε in ver. 36). . . . Unable to determine which consideration is more probable, and in view of more or less equally weighty external evidence, a majority of the Committee voted to include έν in the text, but to enclose it within square brackets. . . .
“By a casting vote Δουβέριος, found in D d gig, was preferred to Δερβαίος, the reading of the other MSS,” R. V. G. Tasker, “Notes on Variant Readings,” The Greek New Testament, Being the Text Translated in The New English Bible, 1961 (Oxford and Cambridge, 1964), p. 433. . . . Nevertheless, in order to reflect the weight of the witnesses that lack έν κυρίω, a majority of the Committee voted to enclose the words within square brackets. . . . In the light of such considerations a majority of the Committee voted to represent the divergent textual evidence by adopting the reading (a), which is supported by אc (K P 049) 81 181 326 1739 copbo Origen, but to enclose τινα within square brackets. I haven’t seen any scholars mock the United Bible Societies’ practice of voting as per above. red: I would include this item unequivocally in the database for determining who Jesus was. pink: I would include this item with reservations (or modifications) in the database. gray: I would not include this item in the database, but I might make use of some of the content in determining who Jesus was. black: I would not include this item in the primary database. red: Jesus undoubtedly said this or something very like it. pink: Jesus probably said something like this. gray: Jesus did not say this, but the ideas contained in it are close to his own. black: Jesus did not say this; it represents the perspective or content of a later or different tradition. pink: Sure sounds like Jesus. black: There’s been some mistake. [I]t is possible for only one person to cast a vote of a particular color, and yet the average to be there. Sometimes a greater complexity lies behind the color coding in a printed edition of the Gospels than one might assume. This system seemed superior to a system that relied on majorities or pluralities of one type or another. In a system that made the dividing line between pink and gray a simple majority, nearly half of the Fellows would lose their vote. There would only be winners and losers. Under weighted averages, all votes would count in the averages. Black votes in particular could readily pull an average down, as students know who have one .. F .. along with several .. A”s. Yet this shortcoming seemed consonant with the methodological skepticism that was a working principle of the Seminar: when in sufficient doubt, leave it out. Funk, Robert W., Roy W. Hoover, and The Jesus Seminar. 1993. 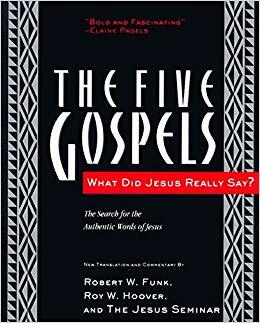 The Five Gospels: The Search for the Authentic Words of Jesus: New Translation and Commentary. New York: Polebridge Press. McGrath, Religion Prof: The Blog of James F. 2018. “The Jesus SeM&Minar.” Religion Prof: The Blog of James F. McGrath (blog). November 9, 2018. https://www.patheos.com/blogs/religionprof/2018/11/the-jesus-semminar-2.html. Metzger, Chair Bruce M. 2005. A Textual Commentary on the Greek New Testament. 2nd ed. edition. Hendrickson. Reich, Keith. 2012. “The Jesus SeM&Minar.” Know Thyself (blog). November 27, 2012. http://keithreich.blogspot.com/2012/11/the-jesus-sem.html. Posted on 2018-11-10 08:18:26 GMT+0000 by Neil Godfrey. This entry was posted in Biblical Scholars and tagged Jesus Seminar. Bookmark the permalink. Yeah, the voting seems like reasonable process to me. The problem isn’t with voting its with the scholarship and arguments that led up to the voting. Reading the line about the KJV translators taking a vote, I’m reminded of the fact that the process in most English translations of the Bible is entirely opaque. Often, the translators themselves are anonymous. Did every translator have a vote? Or did the chief translator have the final say? The real reason the mainstream laughs at the Jesus Seminar’s methodology is they weren’t invited. ‘Development of the Christian biblical canon’ (cf. Wikipedia’s review as a start of comparison) was a better process than that of the Jesus Seminar? lol.